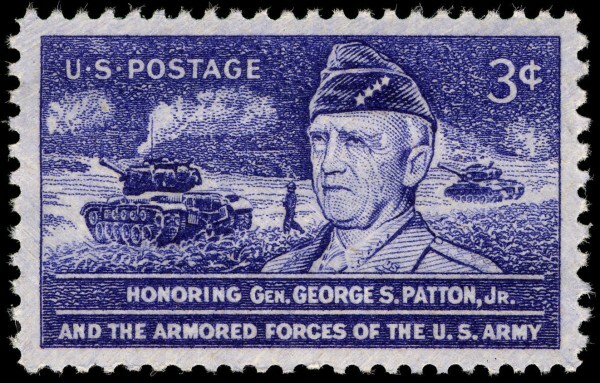 General Patton U.S. commemorative stamp, issued in 1953. Credit: Wikimedia Commons. During the long Cold War many Russians grew sufficiently disenchanted with the lies and omissions of their own news outlets that they turned to Western radio for a glimpse of the truth. The growth of the Internet has now provided Americans with a similar opportunity to click on a foreign website and discover the important stories that have somehow escaped the attention of their own leading journalists. Ironically, much of such “alternative media” coverage actually appears in the leading British newspapers, eminently respectable and published in our closest historic ally. For example, three or four years ago I noticed a link on a prominent libertarian website suggesting that George S. Patton, one of America’s most renowned World War II military commanders, had been murdered by order of the U.S. government. Not being someone much drawn to conspiracy-mongering, the lurid claim seemed totally outlandish, but I decided to click my mouse and harmlessly examine a bit of Internet fringe-lunacy. However, the source turned out to be a lengthy article in Britain’s Sunday Telegraph, one of the world’s leading newspapers, describing a newly published book based on a decade of detailed research and interviews undertaken by an experienced American military affairs writer. The book and the article had appeared in 2008 and I had never heard a word about the story in any of my major American newspapers. The description seemed sufficiently factual and detailed that I consulted a couple of prominent academics I know, with backgrounds in history and political science. They had also never encountered the theory, being just as surprised as I was by the material and by the fact that such remarkable revelations had never received any attention in our own country, home of the freest and most scandal-mongering media in the world. 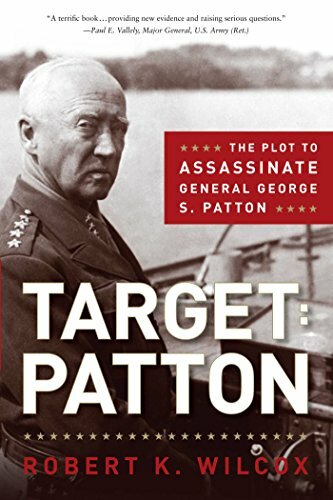 Target Patton, written by Robert K. Wilcox and published by Regnery Press, runs over 450 pages, with an extensive bibliography and nearly 700 footnotes. The many years spent by the author on this project are clearly reflected in the contents, which include numerous personal interviews and the careful analysis of an enormous amount of primary and secondary source material. I’ve seldom encountered so detailed and seemingly exhaustive a work of investigatory journalism, quite understandable given the explosive nature of the charges being made. And yet the expose had never reached readers of the American mainstream media. I personally found the evidence for Patton’s assassination quite persuasive, even overwhelming, and any curious readers can currently order the book for as little as $2.93 plus shipping and judge for themselves. Wilcox himself had been just as shocked as anyone else when he first encountered the surprising claims, but the initial evidence persuaded him to invest years fully researching the theory before publishing the results. Some of his major findings seem quite telling. In the months before his death, Patton had become a powerful critic of the American government, its conduct of World War II, and its policy toward the Soviets. He planned to resign from the military after returning to the U.S. and then begin a major public speaking tour against America’s political leadership; as one of our most celebrated war heroes, his denunciations would certainly have had a huge impact. His fatal car accident took place the day before his scheduled departure home, and he had narrowly escaped death twice before under very strange circumstances. There are extensive personal interviews with the self-confessed government assassin, then attached to America’s OSS intelligence service, the wartime forerunner of the CIA. This operative had a long and substantially documented career in exactly that sort of activity, both during the war itself and for decades afterward, allegedly working internationally on a free-lance basis and “weeding” selected human targets both for the CIA and various other employers. Towards the end of his life, he became disgruntled over what he regarded as his ill-treatment by ungrateful U.S. government bureaucrats and also a bit guilt-ridden over having been responsible for the death of one of America’s greatest military heroes, prompting his decision to go public, with his claims backed by a voluminous personal diary. Numerous other interviews with individuals connected with the circumstances of Patton’s death seemed to largely corroborate the theory. The assassin recounted that OSS Chief William Donovan had ordered the killing on the grounds that Patton had “gone crazy,” becoming a major threat to American national interests. Around this same time, a military counter-intelligence field agent began encountering credible reports of a planned assassination plot against Patton and attempted to warn his superiors, including Donovan; not only were his warnings disregarded, but he was repeatedly threatened, and at one point, even placed under arrest. It seems clear that Donovan’s orders came from his superiors, either in the White House or elsewhere. The motivation may or may not have ultimately had a foreign origin. Over the last twenty years, scholars such as John Earl Haynes and Harvey Klehr have exhaustively demonstrated that during the 1930s and 1940s a large network of Communist spies had gained enormous influence in the uppermost reaches of the American government. Indeed, Wilcox carefully documents how the OSS itself had been heavily infiltrated at the highest levels by elements of the Soviet NKVD, and that during this particular period, the two intelligence organizations were in an ambiguous quasi-partnership, with Donovan being especially eager to curry political favor with the pro-Soviet elements near the top of the U.S. government. Meanwhile, Patton, a zealous anti-Communist, had very different views, urging an immediate military attack on the weakened forces of the Soviet Union. It is easy to understand how Stalin and those American leaders in his orbit might have decided that Patton’s physical removal was an absolute priority. At the time of his death, Patton was the highest ranking U.S. military officer in Europe, and the story naturally became front-page news throughout the world. Several official reports were produced regarding the exact circumstances of the very strange traffic accident responsible, but all of these have completely disappeared from U.S. government files. I find it difficult to imagine a non-sinister explanation for this. These few paragraphs provide merely the smallest slice of the enormous amount of documentary material and painstaking analysis that Wilcox spent ten years compiling for his outstanding book. Obviously, many questions remain, and absolute proof is impossible seventy years after the event. But from my perspective, the likelihood of an assassination, almost certainly with the active involvement of top American officials, seems overwhelming. I have also been reliably informed that for many years there has been a widespread belief within the American intelligence community that Patton was eliminated by the U.S. government for political reasons. Such quiet knowledge in those circles is hardly surprising. The alleged government assassin first publicly confessed his guilt in the plot decades ago in front of a journalist at an OSS reunion dinner in DC, while seated at the table of his longtime friend and colleague William Colby, former Director of the CIA. And although the resulting local news stories were completely ignored by the national media, it is hardly surprising that word soon got around within intelligence circles. Perhaps some experienced scholar with a different perspective could invest time and effort attempting to refute the powerful case set forth by Wilcox, though none apparently has. But suppose that the evidence for this theory is not nearly as overwhelming as it appears, and only sufficient to provide a reasonable possibility that the story is true, perhaps a 25% likelihood. I would argue that if there exists even a slight chance that one of America’s most renowned generals—our top-ranking military officer in post-WWII Europe—was assassinated for political reasons by America’s own government, the scandal would surely rank among the greatest in modern U.S. history. The book was written by a reputable author and published by a mainstream though conservative-oriented press, but it went unmentioned in America’s major national publications, whether conservative or liberal, nor was any subsequent investigation undertaken. A leading British newspaper reported what American journalists had totally ignored. It seems likely that if a similar book had been published providing such solidly-documented historical revisionism regarding the sudden death of a top Russian or Chinese general at the close of the Second World War, the story might have easily reached the front pages of the New York Times, and certainly the weekly Book Review section. Perhaps there might even have been considerable media coverage if the victim had been a prominent Guatemalan general, whose name was totally unknown to most of the American public. Yet similar allegations surrounding the demise of one of America’s most famous and popular military leaders of the 1940s have been of no interest to America’s mainstream journalists. Once again, we must distinguish the two issues. Whether or not I am correct in believing that the case for Patton’s assassination is overwhelming might certainly be disputed. But the fact that the American media has completely failed to report these revelations is absolutely undeniable. As mentioned, I had originally encountered this fascinating history a few years ago, and at the time had been too preoccupied with other matters to publish a column as I’d intended. But having decided to return to the topic, I quickly reread the book to refresh my memory, and found it even more persuasive than I had the first time round. Eight years after original publication, I still failed to find any coverage in our timorous mainstream newspapers, but given the enormous growth of looser web-based journalism, I wondered what might have appeared elsewhere. Googling around a bit, I didn’t find a great deal. A couple of times over the years, Wilcox had managed to place short pieces of his own somewhere, including the New York Post in 2010 and in the American Thinker webzine in 2012, with the latter including mention of a possibly important new witness who had finally decided to come forth. But otherwise his astonishing book seems to have been entirely shoved down the memory-hole. 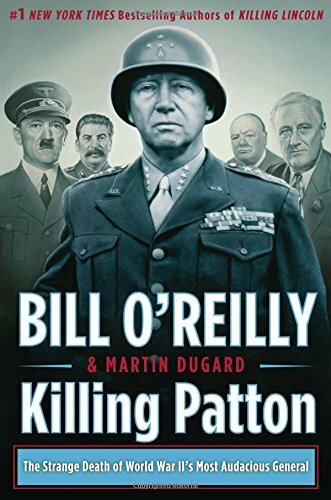 Most notable was Bill O’Reilly, the FoxNews pundit, who published Killing Patton in 2014, another in his series of popular history best-sellers co-authored by Martin Dugard. The very title itself challenged the official story of an accidental car crash, and I eagerly opened the book, only to be severely disappointed. The presentation seemed thin and padded, with perhaps 10% of the text merely rehashing the analysis provided by Wilcox while the remaining 90% represented a rather conventional historical summary of the Western Front near the end of the Second World War, including heavy coverage of the Nazi concentration camps, and with little of this material having any connection to Patton. The only interesting part of the text seemed based on Wilcox’s original research, and that relationship was heavily disguised by the total absence of any footnotes, with the only indication being a single short sentence near the end citing the Wilcox book as a very helpful summary of “the conspiracy theories.” Not unreasonably, the latter author seemed somewhat irritated at the lack of appropriate notice or credit he received. O’Reilly’s dumbed-down book sold over a million copies, with a title proclaiming Patton’s assassination. But the resulting media coverage was still rather scanty and largely negative, criticizing the supposed indulgence of “conspiracy theories.” Media Matters summarized the reaction as “Historians Rip O’Reilly’s New Patton Book,” and given the near-total lack of any documentation provided by O’Reilly, much of that criticism may not have been unreasonable. Thus, the media totally ignored a heavily documented and persuasive book, while attacking and ridiculing a weak one on the same subject, with this dual approach constituting an effective means of obscuring the truth. America’s opinion leaders tend to rely upon our most elite national newspapers for their knowledge of the world, and the only coverage I found in these of O’Reilly’s best-seller was a rather odd opinion piece by Washington Post columnist Richard Cohen. Cohen seemed rather uninterested in the assassination question one way or another, but harshly condemned O’Reilly for devoting insufficient pages to discussing Patton’s alleged anti-Semitism. Indeed, he almost implied that some of the remarks later found in Patton’s private diaries were sufficiently nasty toward Jews that perhaps no American should even care whether our highest ranking general in Europe had been killed by his own government or anyone else. The mentality of our mainstream media these days is very strange indeed, and we live in the world it creates for us. Most recently, the success of the O’Reilly book and our revived Cold War with Russia may have led to production of a new documentary making the case for Patton’s assassination, but possibly reconstructing the facts with a distorted twist. Wilcox’s original research had demonstrated that top American leaders organized Patton’s assassination, though probably in conjunction with the Soviets. O’Reilly provided some of those facts in his book, but his media interviews airbrushed out the American role, simply declaring that “Stalin killed Patton.” And based on news reports, I wonder if this new documentary, apparently made without Wilcox’s involvement, will similarly ignore the massive evidence of direct U.S. government involvement, while perhaps attempting to fix the blame solely upon the nefarious Russians. Finally, this important historical incident provides a useful means of evaluating the credibility of certain widely-used resources. For years I’ve emphasized to people that Wikipedia is absolutely worthless as a source of reliable information on any relatively “controversial” topic. Given Patton’s enormous historical stature, it is hardly surprising that his Wikipedia entry is exceptionally long and detailed, running over 15,000 words, with nearly 300 references and footnotes. But this exhaustive exposition contains not the slightest suggestion of any suspicious aspects to his death. “Wiki-Pravda” indeed.